Tribes Overall: "As I've never taken a tour before, I didn't really know what to expect. ...and I loved every minute. It was so great to have such brilliant service from initial enquiry, booking and then through to meeting such lovely, helpful people from start to finish. The guides especially were of exceptional quality...great personalities, language skills and knowledge base. 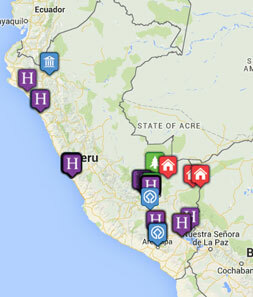 Trip was great overall value and the Inca trail was one of the best experiences of my life." Tribes Service: "Paul was the best ever...very helpful, knowledgeable, and always responded promptly to emails"
Guides: "Edison was absolutely the best guide we could have hoped for on the Inca trail. Great knowledge, language skills, sense of humour but also very aware and empathic to our needs. I'll never forget him. Jose Antonio, in the jungle, also of a very high standard. Great language and knowledge and brilliant at spotting highly camouflaged wild life!" Social & Environmental Responsibility: "Our chef on the Inca trail gave a speech where he thanked us for coming to his country and enabling them to work hard for their families...very genuine and moving . The porters all seemed to be happy to be working and said they enjoyed their jobs." Staff friendly and helpful especially about my lost case. Helped me contact my insurance company and kept me updated. Always polite and lovely buffet breakfast. Room had two shower rooms which was great for us two. Loved this town and centrally situated. A little more impersonal than the others but lovely rooms and breakfast so no complaints. Beautiful grounds surrounded by mountains with Llamas outside the windows. Breakfast and staff were brilliant. Missed our night here due to our own mistake, but did have a shower and breakfast. Seemed fantastic. Beautiful place and great service. The food was also wonderful with lots of choice. The staff were friendly and helpful. The only reason for not an excellent mark was that they kept forgetting to switch the lighting off at night and the water was also cold some morning for a shower. Not normally so much of a problem but had a particularly cold spell whilst there so could also have done with an extra blanket. Very cold at night, didn't expect this in the jungle so didn't take warm clothes. Wind whistled through our open sided room so would have been good to be able to draw something across...although it must be said that this weather only happens 3-4 times per year, apparently! Not such a high standard of room and shower room was a bit tired. Staff were efficient and breakfast was fine. "Our chef, Daniel, on the Inca trail coming out in his chef\'s whites with a decorated birthday cake for my friends 60th birthday. He then repeated this amazing feat with a second cake for my 60th birthday 3 days later ......and all the porters singing Happy Birthday to us....one of the most memorable birthdays ever...made turning 60 not feel quite so bad....although I actually felt about 100 at the time!" "I'd taken my iPod in case I needed some motivational music to help me complete the Inca trail but was enjoying the scenery and serenity too much to need it....until the last 2 hours of the climb to Dead Woman\'s pass! So I had it on shuffle and with about 100 stairs to go "stairway to heaven" came on...so thanks, Led Zeppelin, that last few minutes got me to the top"